December is a busy yet lovely time of the year here at Sugargarden. This year, among sugar flower projects and new cake designs I managed to create this easy tutorial for one of the most classic of Christmas decorations: the Holly. You can make a few now and store them in a cardboard box until needed. Use the lovely little sprays to decorate mini-cakes or cupcakes (please be advised that wired floral decorations are not designed to be eaten, due to the presence of inedible elements like wire and floristry tape) or add a tag and use them as place holders or Christmas table decorations. 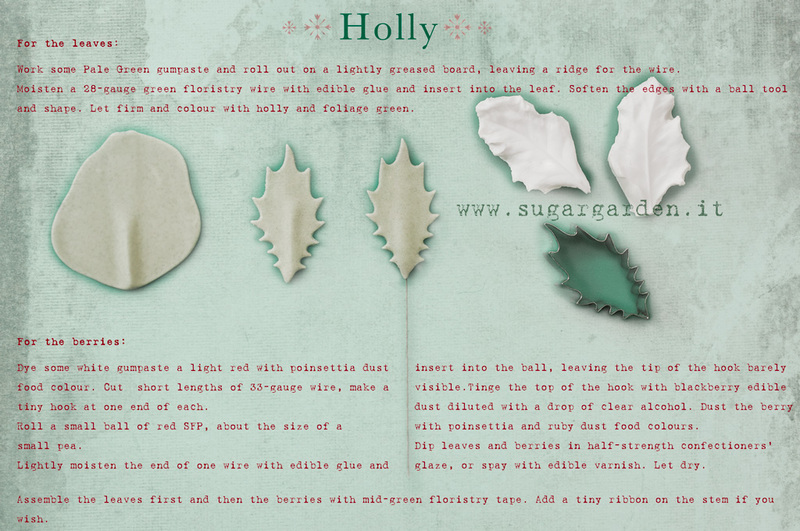 Elegant and understated, holly is so easy and fun to make in gumpaste, I never get tired of it. I hope you will enjoy making holly berries and leaves as much as I do. So, if you are in the mood for an easy but rewarding DIY project this Christmas just check out this tutorial and have fun! I wish you all my best and a really Merry & sweet Christmas time. Work some Pale green gumpaste and roll out on a lightly greased board, leaving a ridge for the wire. Cut a leaf with the holly leaf cutter. Moisten a 28-gauge green floristry wire with edible glue and insert into the leaf. Soften the edges with a ball tool and shape. Let firm and colour with holly and foliage green. Cut short lengths of 33-gauge wire, make a tiny hook at one end of each. Roll a tiny ball of Poinsettia SFP, about the size of a small pea. Lightly moisten the end of one wire with edible glue and insert in the middle of the ball, leaving the tip of the hook barely visible. Tinge the top of the hook with blackberry edible dust diluted with a drop of clear alcohol. Dust the berry with poinsettia and ruby dust food colours. Dip leaves and berries in half-strength confectioners’ glaze, or spay with edible varnish. Let dry. Assemble the leaves first and then the berries with mid-green floristry tape. Add a tiny ribbon at the base of the leaves if you wish. This entry was posted in Sugar flowers, Tutorials and tagged Christmas, Holly, Pungitopo, Sugar flowers on Friday December 20th, 2013 by Susanna Righetto.